Warm & Windy Today - Back To Winter Tue & Wed. US Hwy 82 Just East Of Dunken, New Mexico (Chaves County) Looking West. 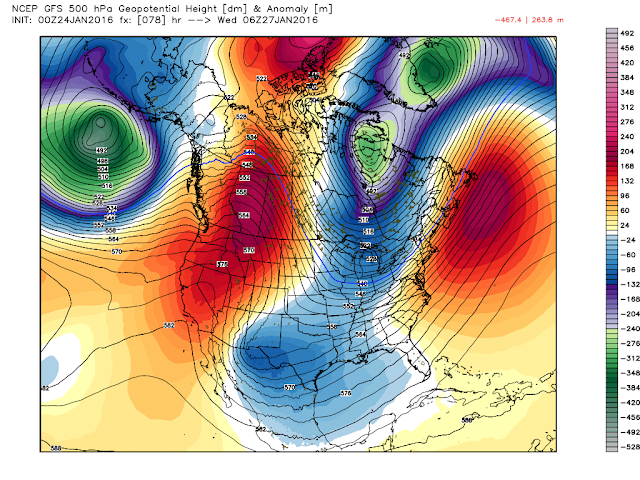 Last Night's 00Z/5 PM MST GFS 500 MB Forecast. Valid @ 11 PM MST Tuesday, January 26, 2016. For those of you who were thinking or hoping that winter was over..I hate to be the bearer of bad news but, its not. Our next bout of winter winter will come from a long wave trough of low pressure that is currently located along the West Coast. 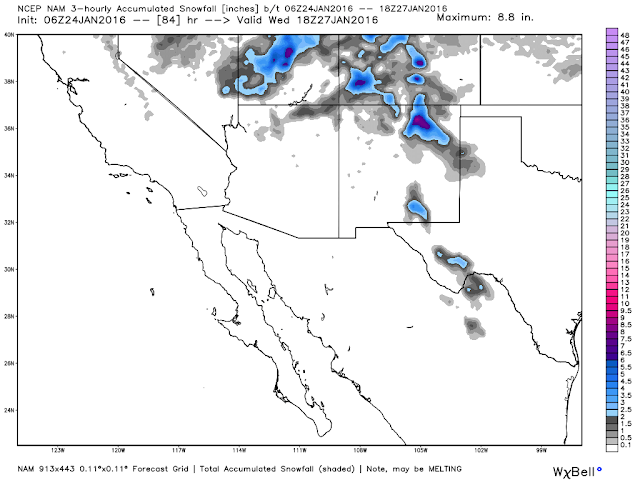 As this trough of low pressure (centered in the mid levels of the atmosphere at the 18,000' level) moves east a piece of this energy is forecast to "break off" over southern New Mexico by Tuesday. 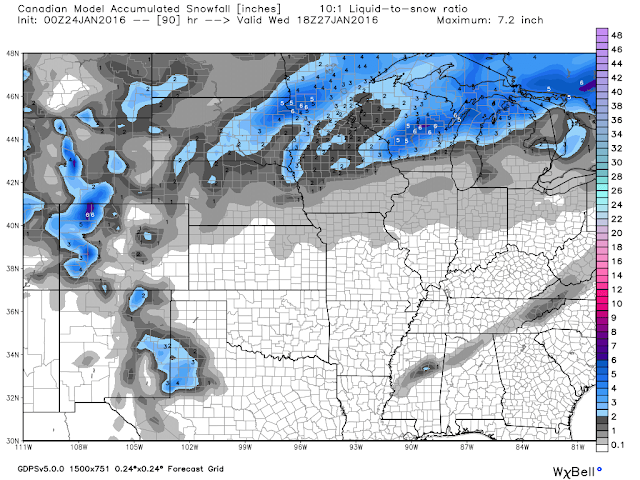 Current model forecasts indicate that it will not linger in the area very long so this should be a short lived storm. First- Warm & Windy Ahead Of The Storm. 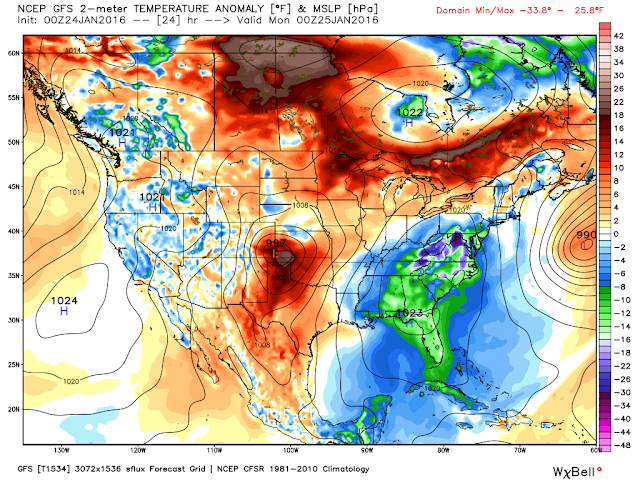 Valid @ 5 PM MST Sunday, January 24, 2016. A deepening surface low centered over the western Oklahoma Panhandle by sunset today will help do two things. First a tight surface pressure gradient wrapping around the surface low combined with strong winds aloft which will mix down to the surface this afternoon will generate strong to high winds across much of the state today. West winds sustained at 40-50 mph with gusts near 70 mph are forecast for the Guadalupe Mountains of southeastern New Mexico and West Texas this afternoon - thus a High Wind Warning is in effect. A Wind Advisory for southwesterly to westerly winds sustained at around 35-40 mph with gusts near 50 mph is in effect for parts of southern New Mexico including the southern Sacramento Mountains. Southwesterly winds sustained at 25-35 mph with gusts near 55 mph will rake the southeastern plains of New Mexico this afternoon. A Red Flag Warning (seems out of place given how wet the winter has been right?) is also in effect today. Lets all jump for joy (NOT) since our preverbal high winter winds have returned. A bit of sarcasm folks. Our afternoon high temperatures today will be some of the warmest readings we've seen since mid December when the upper 70's to low 80's were noted. 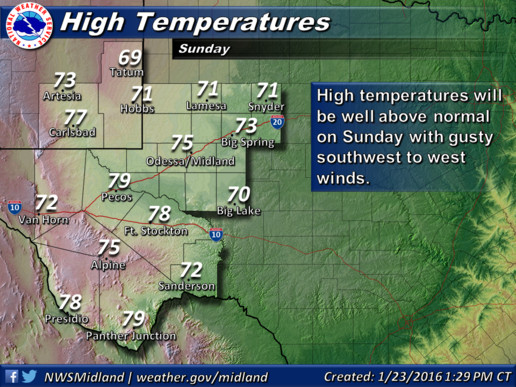 Today's forecast highs for the southeastern plains will be in the mid to upper 70's. An 80-degree reading or two is not totally out of question. These readings will be some 10 to 15 degrees above normal. A Quick Shot At Winter. 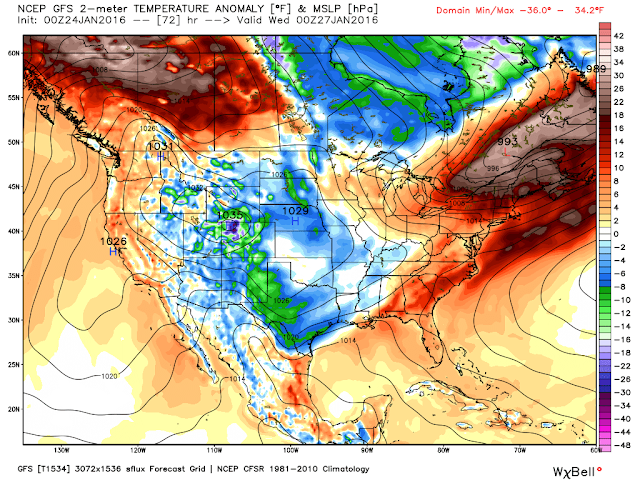 GFS Surface Temperature Anomaly Forecast. 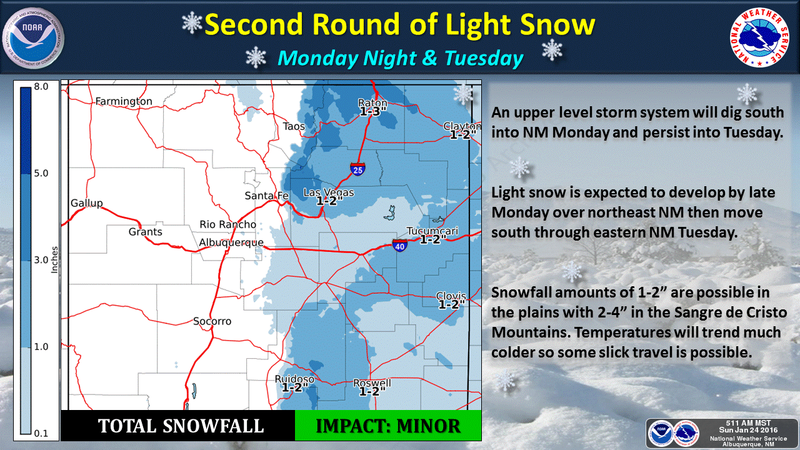 Valid @ 5 PM MST Tuesday, January 26, 2016. A cold front will sweep across the state on Tuesday dropping our daytime high temperatures some 10 to 15 degrees below normal by sunset. Current forecasts call for our high temps on Tuesday and Wednesday to be in the 40's. 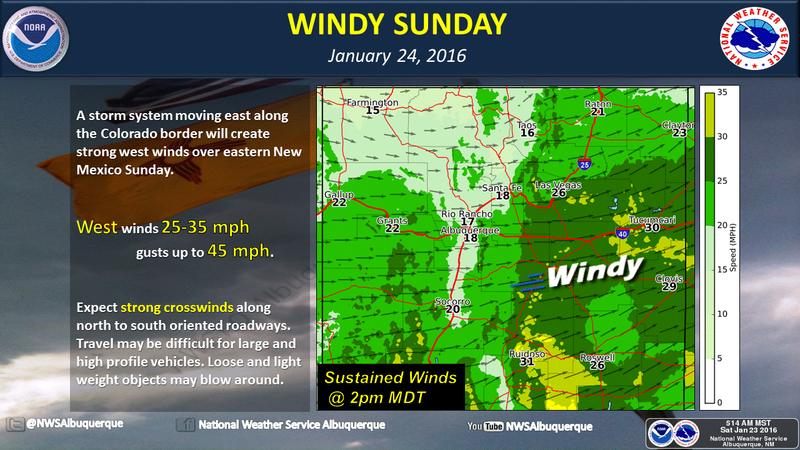 (Blog Updated @ 7:30 AM MST Sunday, January 24, 2016). 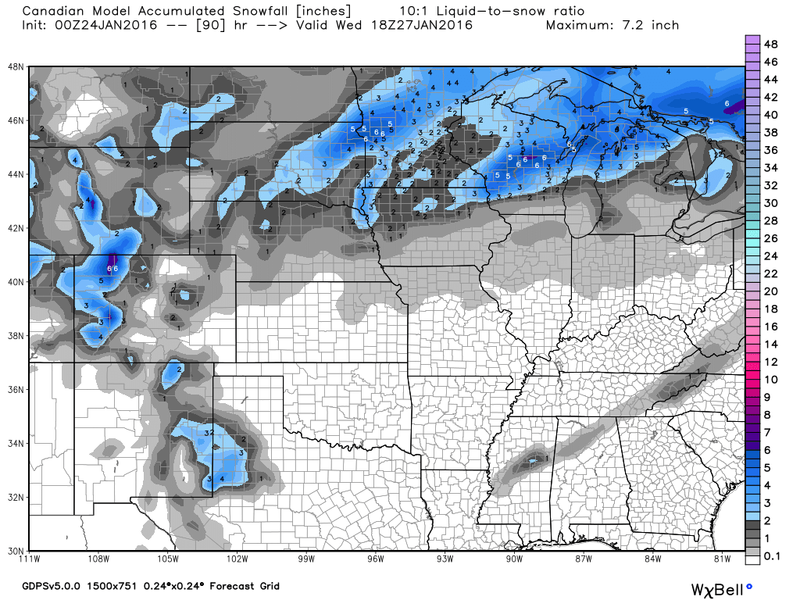 Valid @ 5 PM MST Wednesday, January 27, 2016. Valid @ 11 AM MST Wednesday, January 27, 2016. 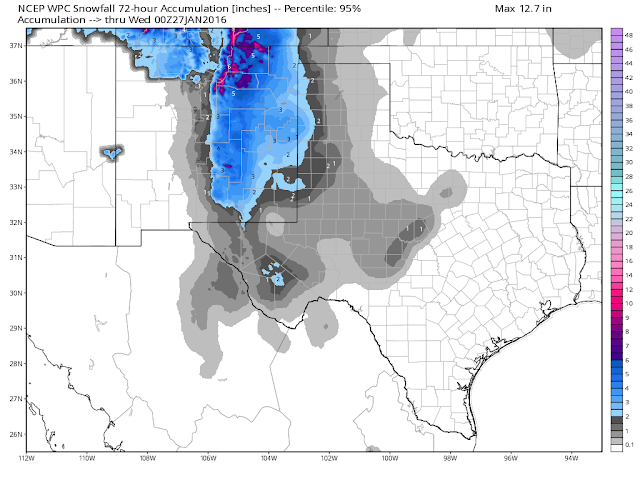 Updated WPC 72-Hour Accumulated Snowfall Forecast. 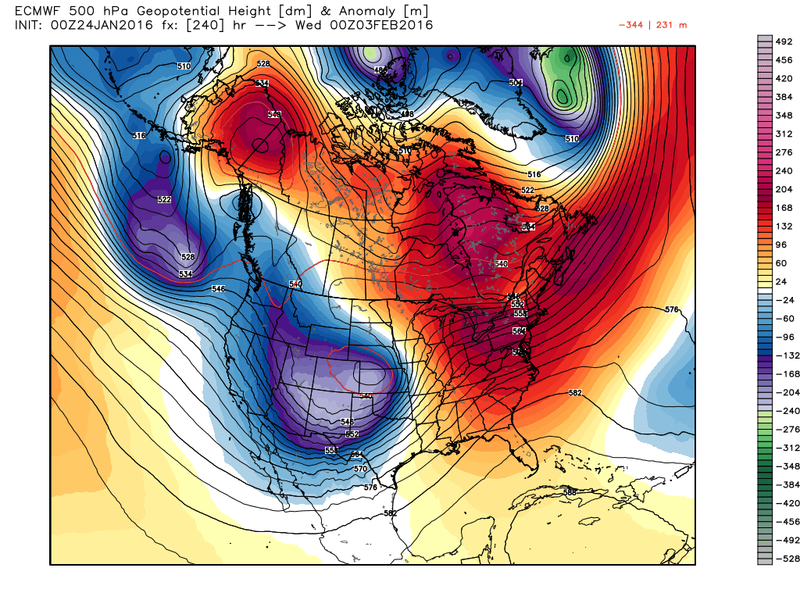 Valid @ 5 AM MST Wednesday, January 27, 2016. 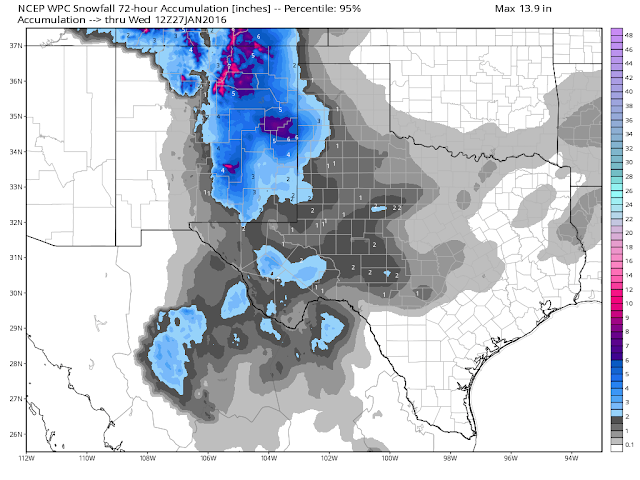 WPC 72-Hour Accumulated Snowfall Forecast. With colder air working into the area Tuesday and the mid-upper level storm dropping south through the area it appears that a chance for light snow exists Tuesday afternoon into Wednesday morning. Most of the models agree that any snow that falls will be in the trace to a an inch or two category over the southeastern plains. As is normally the case the Guadalupe, Sacramento, and Capitan Mountains may see slightly higher totals. 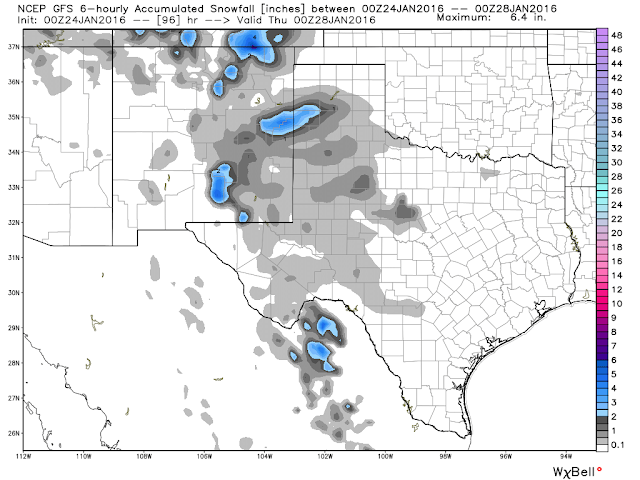 Next Major Winter Storm For New Mexico? Valid @ 5 PM MST Tuesday, February 2, 2016. Down the road all eyes are already peering at our next potential Major Winter Storm to affect the state and nearby areas around the 1st of February.Winter isn't done with us yet!